Salt And Pepper Cellars, Wells And Boxes have become quite popular in the last few years. There are a number of specialized salts and pepper grinds that are available now that lend themselves to serving out of a well. These are only to be used with dry items, nothing that is wet! What better way to present those gourmet condiments than a handmade (by a craftsman in Pennsylvania using Pennsylvania woods) set of salt and pepper wells or a salt and pepper box? Mine are engineered to hold approximately 1/3 of a cup (3 ounces) of salt or pepper in each well. The lids are not attached to the well but have a lip that holds them in place in the top of the well. The individual SALT AND PEPPER CELLARS are turned out of White Ash. The pepper cellar and lid are then dyed black for easy recognition. These wells are approximately 2.75” diameter by 2” high (with the lid in place). 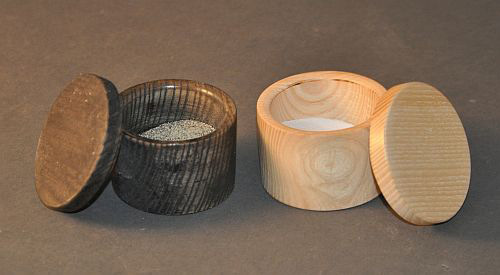 The SALT AND PEPPER BOXES WITH TOOTHPICK HOLDER have two 2 1/8” diameter wells and one 1 1/8” well. These boxes are approximately 8.75” long by 3.5” wide by 2” high. The two large wells have lids, the small one does not. The larger 2 are for salt and pepper, sugar, herbal tea or whatever dry items you wish. 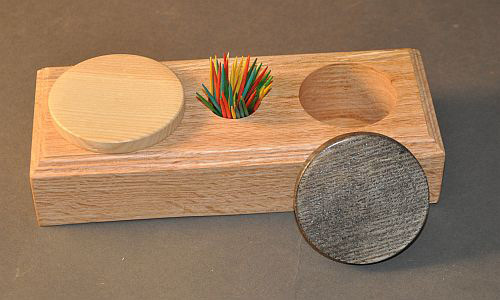 The smaller well is for items like toothpicks. The SALT AND PEPPER BOXES have two 2 1/8” wells but no toothpick well. The box is approximately 7.5” long by 3.5” wide by 2” high. The SALT AND PEPPER CELLARS are available in White Ash. If you have a preference for other woods, contact me and I’ll try to accommodate you. 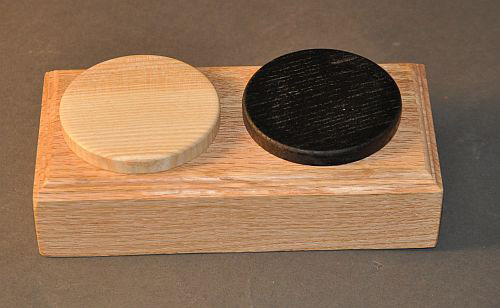 Both of the types of SALT AND PEPPER BOXES are available in Oak, Black Cherry or White Ash, your preference. The lids of all of these are White Ash with the pepper being dyed black. If you use a variety of spices that would fit into wells such as these, I also make a larger, 4-well box with a toothpick holder. Please enquire about these if interested. Salt and pepper and toothpicks are not included with these item.